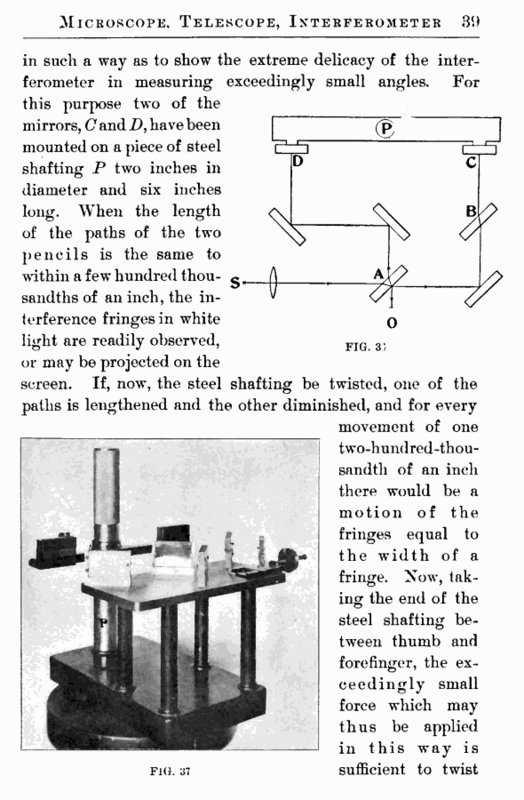 the solid steel shafting through an angle which is very readilv observed by the movement of the fringes across the field. the rear of the plate A, part of it being reflected to the plane mirror C, returning exactly, on its path through A, to O, where it may be examined by a telescope or received upon a screen. 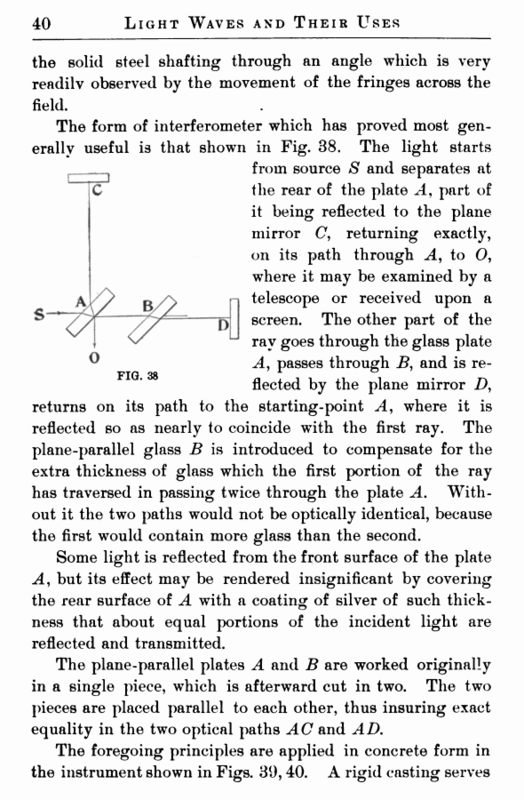 The other part of the ray goes through the glass plate A, passes through B, and is reflected by the plane mirror D, returns on its path to the starting-point A, where it is reflected so as nearly to coincide with the first ray. The plane-parallel glass B is introduced to compensate for the extra thickness of glass which the first portion of the ray has traversed in passing twice through the plate A. Without it the two paths would not be optically identical, because the first would contain more glass than the second. Some light is reflected from the front surface of the plate A, but its effect may be rendered insignificant by covering the rear surface of A with a coating of silver of such thickness that about equal portions of the incident light are reflected and transmitted. The plane-parallel plates A and B are worked originally in a single piece, which is afterward cut in two. The two pieces are placed parallel to each other, thus insuring exact equality in the two optical paths AC and AD.